In 2010, all eyes were on Vancouver as it hosted the 21st Winter Olympic Games. Fans, athletes and everyone else crowded the downtown core celebrating and enjoying the event. In preparation for the grand occasion, Vancouver went through upgrades, introducing new sport complexes and public spaces and a safer highway to Whistler. Most of what was created for the Olympics is still in use today, such as the Convention Centre and Richmond’s Olympic Oval. While those locations became a regular part of the city’s landmark, the Olympic cauldron is still able to spark memories of the crowded streets and national pride. 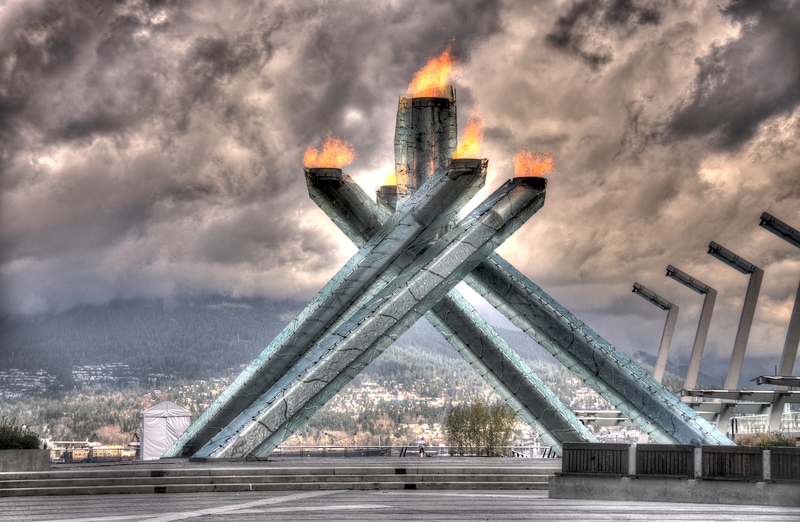 Since the day it was unveiled, the cauldron has been a famous icon in Vancouver. So much that organizers were unprepared for its popularity during the two weeks event in 2010. A fence had to be constructed to keep spectators back, until a viewing spot can be built on higher ground. Today, the best spot to see it would be on the upper level of the Convention Centre. Built to resemble five pillars of ice leaning against each other, the Olympic cauldron is now accessible for anyone eager to get a closer look. During the night, the transparent pillars will illuminate blue and green. Set in the centre of a fountain, against the Coal Harbour backdrop, the cauldron is a photogenic image of the city. On special occasions, the cauldron would be re-lit. But the initial lighting is what most people remember. During the opening ceremony in BC Place, there were two Olympic cauldrons, the one we know now outdoors and another one in the stadium for the show. At the end of the ceremony, four famous Canadian athletes were supposed to light the pillars of the BC Place cauldron and have the flames travel up to the top of the bowl, but due to mechanical issues, one of the pillars did not rise. It was embarrassing for the organizers and awkward for the audience. Having two cauldrons meant that there would be two lightings. So a pick-up truck transported hockey legend, Wayne Gretzky with the Olympic flame from the stadium to the site of the outdoor cauldron. There, he fulfilled one of the greatest athletic honours in all of sports — lighting the Olympic Cauldron.